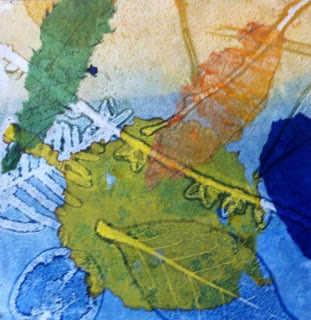 Recent activity with printmaking workshops and exhibitions. Residencies and trips to overseas galleries. New experimental media such as plaster etching, three dimensional printmaking and multi-media techniques. A year has flown by since I visited this blog, and what a year, lots of travel, lots of print and lots of meeting fabulous new printmaking colleagues. I guess I should work backwards through the year. I was delighted to have my work "Earth Stones" accepted by the selector Lisa Reihana for the biennial exhibition "EAST" in Hawkes Bay which is currently showing at Hastings City Art Gallery. These works are individually my largest plaster printed work and presented all sorts of challenges but I am pretty satisfied with the results. The installation consists of eight pieces, here's a wee sample. Each stone is approx. 400mm dia. I was very chuffed to read the article by Nan Mulder (thanks Nan) in the latest Printmaking Today about my printmaking on plaster journey. Its a great magazine for printmakers all around the world. It was wonderful to be invited to AiR at Umbrella Studio Gallery in Townsville, Queensland, Australia. What agreat time I had. The accommodation was super and the welcome very warm ( literally, up in the early 30% which was a bit of a shock coming from the colder climes of NZ) and friendly. I felt right at home immediately. Fortunately my few days stop off in Brisbane helped me acclimatise. I spent the time at Umbrella working with plaster printmaking and using seed pods and leaves gathered at the beautiful botanical gardens. A visit to the excellent Perc Tucker Regional Gallery was a bit of highlight. I also was able to visit a lovely little gallery, Gallery 48 where the PCANZ, "Leaving Your Mark" 50 year collaborative prints were being exhibited. The residency culminated with me teaching a two day plaster printmaking workshop with some of the amazing local Townsville printmakers. Absolutelytoo short of time, loved every minute. between Impress Printmakers and PCANZ members. it was wonderful to be at the opening of this exhibition, meet Brisbane printmakers and enjoy the beautiful gallery space at Impress Studio. The Saturday and Sunday following the exhibition opening I taught a plaster printmaking workshop to members of Impress Studio. a great facility and a very enjoyable time. Not sure what has happened to all my photos , so won't be able to share unfortunately. its been such a long time since I have posted anything here, put it down to a VERY busy year. So I will do a bit of a catch up. range of presentations, wonderful hospitality and a fabulous opportunity to meet with so many printmakers. I can't rate this event highly enough, put my name down for the next one! But of course a lot of time was spent prior to the event preparing examples to take with me. This posed a bit of a problem as most of my work is large and the weight made it impossible to carry on the plane. so the answer ...create a selection of mini works that illustrated various techniques. The images below are a sample of what I demonstrated. My work "Walking the dog, Vines" was also shortlisted for Mildura Print Prize exhibition, the selector Sasha Grishin. It's been a really busy year for workshops at both schools and with adult groups, all wonderful participants and I have had a fabulous time. I always come away from a workshop I have taught feeling I have gained as much from the students as they have from me, so just a few images from these classes. The school workshops were over several days, with the children working with found materials, constructing artists books and creating prints to be hung, using offset printing techniques, chine colle, and the most fun of all burning holes! Here is a selection from several school programmes. A brief selection of students work from some of the adult workshops I have taught. I feel I have really travelled the country this year teaching workshops from the bottom of the South Island to middle of the North Island, so much fun, so rewarding. 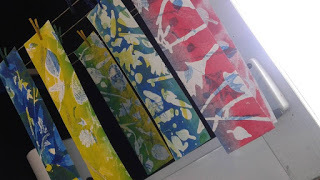 The workshops have used a wide range of techniques that explore texture and markmaking, upcycling old prints, using stencilling, monoprint, chine colle and a range of mediums not usually associated with traditional printmaking to create multi medium prints. These two works were selected for the Mairangi Bay Arts Centre "First Impressions" Exhibition 2015. The exhibition is on from March the 4th to March 28th. 2 plate collagraph, chine colle. I had a fantastic time teaching at Kim Brashes Blue Fantail Studio which is situated in the North Otago ArtSociety premises, the historic Custom House building. I was so pleased to be invited to teach there and have the opportunity to spend some time in beautiful Oamaru. The studio space was great to work in and all of those on the mixed media printmaking course worked incredibly hard and produced fabulous work. Here's just some of the results.